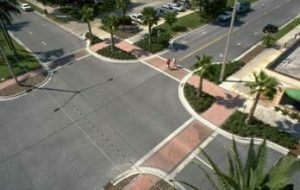 Neck-downs, bulb-outs, chokers, and mid-block crossings are physical devices placed in the roadway to create horizontal deflections by narrowing points along the roadway. Aerial view of bulb-outs (City of Winston-Salem, North Carolina 2003). Neck-downs, bulb-outs, chokers, and mid-block crossings are physical devices placed in the roadway to create horizontal deflections by narrowing points along the roadway. Drivers are forced to slow to negotiate the narrowed points on the roadway. When applied on a two-lane road (each direction), these techniques can be used to narrow the lanes and slow traffic or to reduce the two lanes to one. An Institute of Transportation Engineers (ITE) study indicates that narrowing results in a 2.6 miles per hour (mph) speed reduction (Ewing 1999). No crash modification factors (CMFs) were found relating to neck-downs, bulb-outs, chokers, or mid-block crossings. Devices used to narrow lanes physically should be used with caution for the types and amounts of traffic on primary roadways through small communities. Use of neck-downs, bulb-outs, chokers, and mid-block crossings may not be appropriate with heavy truck traffic and/or large farm equipment. The uses of bulb-outs, neck-downs, chokers, and mid-block crossing have a very high cost if designing them into the roadway. A cheaper alternative is paint markings, which may have a lower effectiveness. City of Winston-Salem, North Carolina. “Traffic Calming Policy. Section IV.” Traffic Calming Measures, 2003. Ewing, Reid. Traffic Calming: State of the Practice. Washington, DC: Institute of Transportation Engineers, U.S. Department of Transportation, 1999.